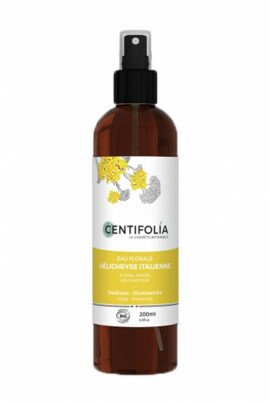 Centifolia Organic Floral Water with Helichrysum soothes irritations and sensitive areas of dull and tired skin! Known for its toning and enlightening properties, it brings radiance to your complexion by improving the blood circulation of your skin. This organic hydrolat cleanses the traces of your make-up. With Centifolia Immortal Floral Water Spray, your skin is moisturized and soft! Je l 'utilise en été quand la peau est fragilisée par le soleil en alternative à l'eau de rose; trés agréable et efficace mis à part l'odeur! Centifolia Natural Water Flower with Everlasting Flower is ideal for toning the skin ! Apply Helichrysum hydrolat morning and/or evening with a cotton pad soaked or sprayed, as a skin care product or simply to complete the make-up removal. Natural & organic composition of CENTIFOLIA Helichrysum Italicum Flower Water !